Sue is the owner of SueMedia Productions, a full service audio production company. She is an audio producer, director, writer, and sound designer. For more than 20 years she has produced award winning audio drama for public radio and audiobooks. In 2012 Sue was certified on ProTools after completing training from Avid and passing the certification test. 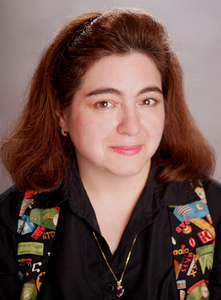 In 2012, Sue also created the ‘illuminated style’ of audiobooks (http://www.suemediaproductions.com/illuminated-production-from-suemedia.html) for the novel “Swordspoint,” which won the 2013 Audie Award for Audio Drama and has also received an Earphones Award. It is featured as part of Neil Gaiman Presents at Audible.com. The sequel to Swordspoint, The Privilege of the Sword, was also nominated for a 2013 Audie for Multi-Voice Production. In 2012 SueMedia Productions was a 3-time Audie Finalist for “The Witches of Lublin” (Distinguished Achievement in Production, Best Original, Best Packaging) which has received numerous others awards including a Gracie (Best Director), a Gabriel, an Earphones Award, A Communicator Award of Distinction, and an International Radio Finalist Award for Audio Drama. In 2011 SueMedia was an Audie Finalist for “William’s Leap For Freedom” and 2010 Sue was part of the Blackstone team that won an Audie for “The Black Mask.” 2009 saw her receive an Audie Finalist nomination for “Jack’s Last Call: Say Goodbye to Kerouac.” Currently she is the President of the Board of NATF, which launched HEAR Now: The Audio Fiction and Arts Festival – THE ONLY festival in the U.S. helping to celebrate the work of audio storytellers. When not producing and directing, Sue specializes in manual SFX (Foley) effects for all styles of audio production. Sue also teaches sound production at NYU’s Tisch Film School and is a Radio Producer for CUNY-TV and Radio in NYC where she is helping to develop new plays for the radio.